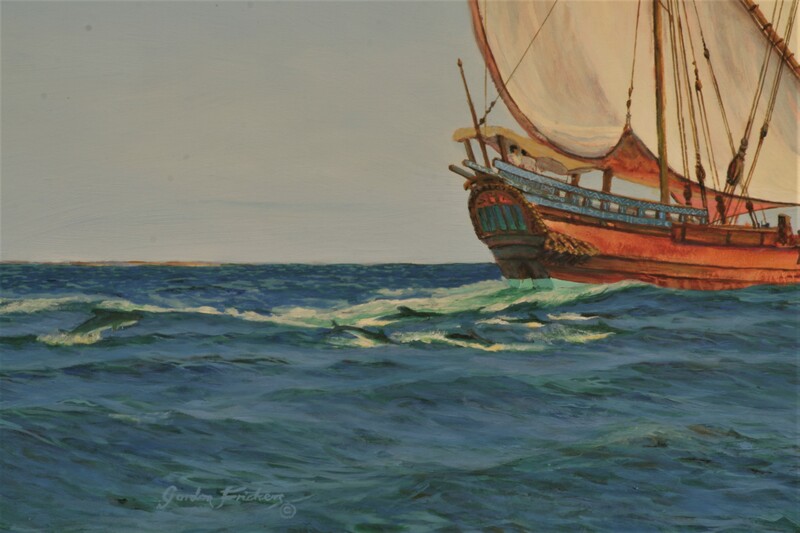 Dhow with Dolphins, this marine painting measures 48 x 61 cms (19″ x 24″), Oils, £1500. 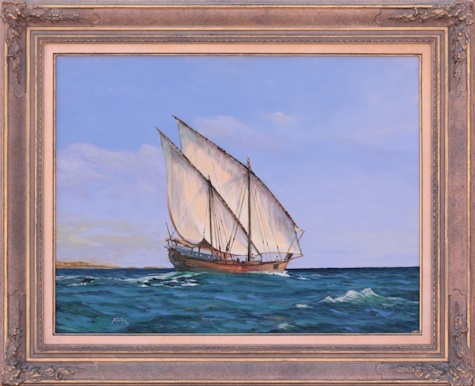 A rare opportunity to acquire a painting of one of these picturesque historic vessels, little known beyond their home waters. This charming marine painting is available, payment can be made in easy installments. Dolphins love to accompany ships often playing in the pressure wave created by water displaced by the moving hull. On occasion these animals, so wonderful to see in their wild state have been known to guide ships through difficult passages. 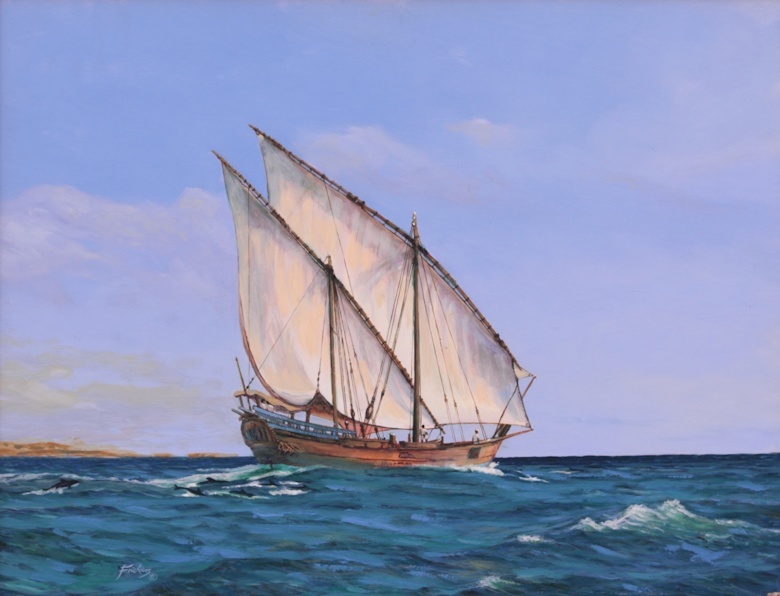 “Dhow and Dolphins” was initiated as a result of research into the world of Arab dhows while preparing a series of paintings for His Majesty Sultan Qaboos Bin Said of Oman’s public buildings and private yacht. 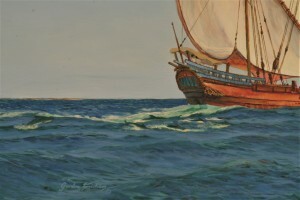 Very much a sailor’s painting, a dhow her natural environment, the open ocean, on a splendid day for sailing. This vessel, the Sanbeq type was developed in antiquity. 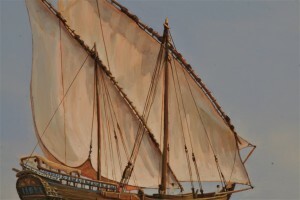 Sanbeq’s were probably sailing in the days of Jesus of Nazareth and certainly at the time of Mohammed. Sanbeq’s were built by a very ancient method, examples of the method have been found in Egyptian tombs, built by tying closely fitted planks together with rope. The technique produced a sea worthy hull that would flex to ‘take the ground’ well (dry out on a beach) provided the crew accepted bailing was an essential preoccupation while afloat. 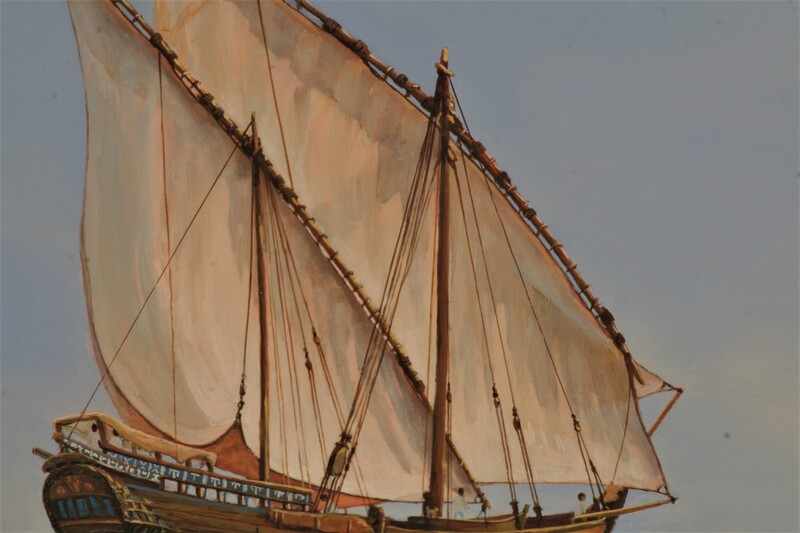 The flexible hull was not easily damaged by sitting on sand or mud but when used to attack the first Portuguese ships to explore the Arabian Sea the Sanbaq were easily shot to pieces. A more solid form of construction was adopted. 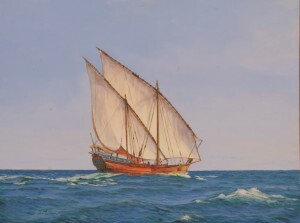 Today most dhow construction is in the West European style. Motorized Sanbeq are still used today including for piracy. This painting is one of a series. Most were sold to the government of Oman. 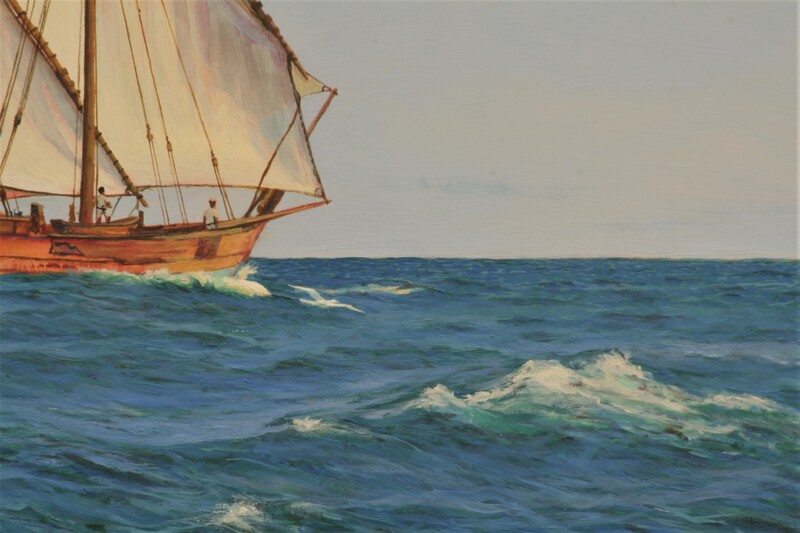 Marine Painting By Gordon Frickers 48 x 61 cms (19″ x 24″), Oils, £1500.